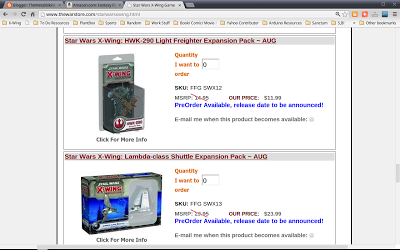 TheMetalBikini.com- X-Wing Miniatures and more: Wave 3 in Boxes? Apologies if this is already over the internet, it's been a busy week starting the new job and I haven't really kept up on the scene this week. Also note that TheWarStore.com seems to be indicating an August release for Wave 3 in their product titles. How accurate is that? Well, doing a little more looking around, I found the Edge of the Empire Core Rules, but instead of the title containing an abbreviated month, it just said, "TBA" on both the Core Rules and also the GM's Screen. So, what do we think? Do we get our hopes up for August or do we get cynical and just assume Christmas if we're lucky? 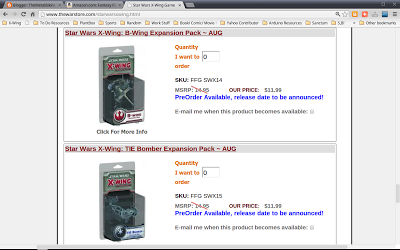 Oh- and as for retailers still stocking X-Wing Expansions, honestly, if I were looking to pick up a particular ship I'd just go to Amazon and call it a day. If I was just getting into X-Wing, it seems like most everybody has Core Sets, the YT-1300, and Firespray-31. I'd suggest picking up two Core Sets and one each of the big ships. You could run some fun lists with just those models.